The Gulf fritillary, Agraulis vanilla, is in the Nymphalidae, or brush footed, family and the subfamily of Heliconiiae. 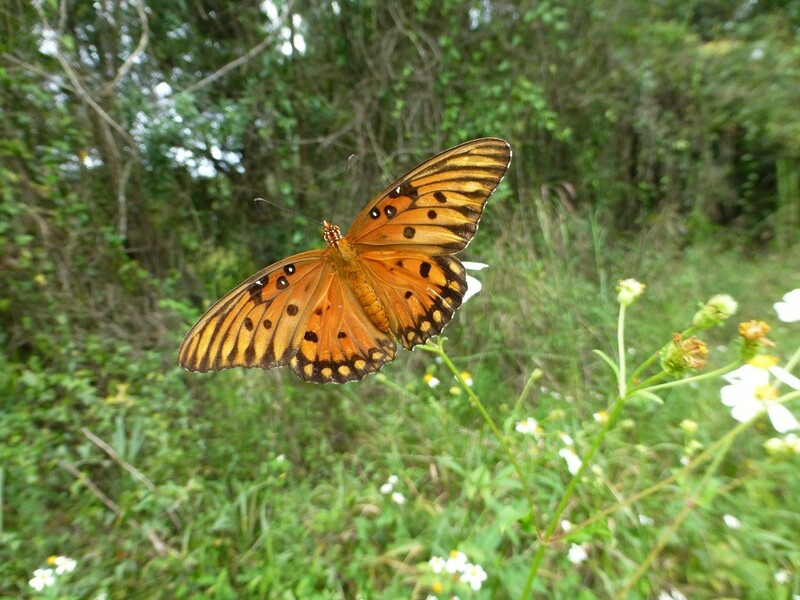 Helicaonian butterflies in Florida include the gulf fritillary, zebra longwing, and the julia. The julia is more of a southern Florida butterfly and only rarely seen in central Florida. The gulf fritillary is a fast flier and generally stays close to the ground in search of nectar and larval food sources. It prefers fields of wildflowers, roadside stands of wildflowers and flower gardens with lots of sunshine. It ranges as far north as North Carolina, west to California, and south to Argentina and the West Indies. It is a tropical butterfly and needs warm weather to survive. It is red-orange above with a few black spots. The underside is similar, but with a coral – pink base and metallic silver teardrops. Some of its preferred nectar plants are beggarticks (Bidens pilosa), red salvia (Salvia coccinea), blue porterweed (Stachytarpheta jamaicensis), golden dewdrop (Duranta repens), and ironweed (Vernonia gigantea). family. Native passion vines in our area of central Florida are (purple passionflower) Passiflora incarnata, (yellow passionflower) Passiflora lutea, and (corkystem passionflower) Passiflora suberosa. Gulf fritillaries seem to prefer full sun and therefore the purple passion flower, Passiflora incarnata, because it grows in full sun and open fields. The eggs are oblong, ribbed, and yellow, and are laid singly on the new growth of the vine. 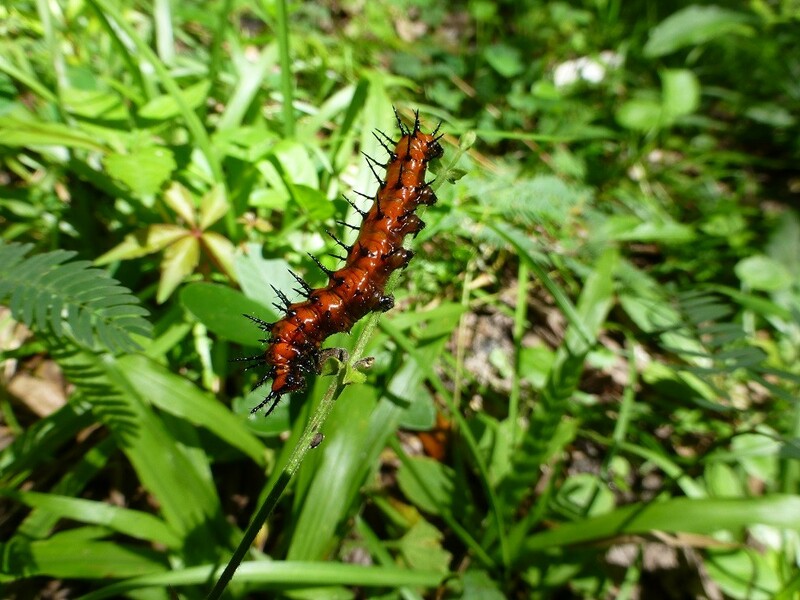 The larva, or caterpillar, is rust colored with branching, black, spines that are stingless. The chrysalis is mottled brown and warty, resembling a dried leaf.